Despite playing against one of the nation’s elite teams, the USD men’s basketball team showed that it could compete with the best of them. The Toreros (15-8, 6-5 West Coast Conference) came close twice in the final five minutes to upsetting the No. 14 Bulldogs at McCarthey Athletic Center on Thursday night. Gonzaga (20-4, 10-1 WCC), instead, went on a 6-0 run in the final two minutes for the 69-59 win. The game featured eight lead changes but USD started off well. Trailing 8-5, the Toreros went on a 10-2 run to take a 15-10 lead early in the first half. By the time halftime rolled around, USD was behind 36-27. The Toreros went on a 13-2 run to open the second half and retake the lead at 40-38. Gonzaga responded with an 11-0 rally for the lead again, 49-40. 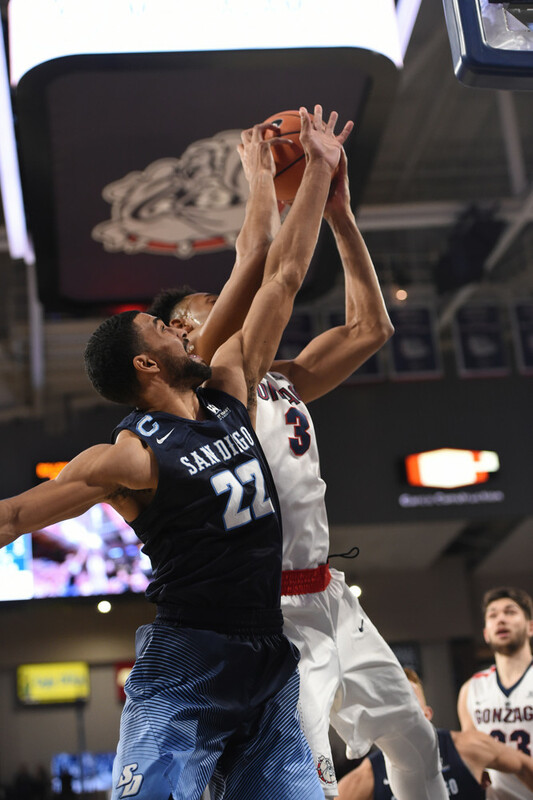 Both teams traded baskets but USD would not get any closer than two points away in the final five minutes before the Bulldogs pulled away for the win. “We gave them too many second-chance opportunities and it’s hard to do that and win on the road,” Smith said. Both teams were sluggish in shooting with USD making 20 of 61 shots while Gonzaga made 25 of 61. Olin Carter III scored a game-high 21 points, Isaiah Pineiro had 13 and Isaiah Wright added 12 for the Toreros. The road ahead won’t get any easier for USD. The Toreros host No. 13 St. Mary’s on Saturday at Jenny Craig Pavillion.